Wake up with the gentlemanly musk of Chemical Guys Morning Wood Scent. Who knew you could bottle the scent of hard wood? Makers of fine perfumes, colognes, and oil-based diffuser scents have turned to woody fragrances to inspire a feeling of sophistication, refinement, and masculinity, and now you can enjoy the same refined body fragrances while traveling in the automobile. Chemical Guys Morning Wood Scent captures the woody and earthy essence of Sandalwood, Cedar, Pine, and Redwood. It 's the scent for a lumberjack at a white tie dinner party. Chemical Guys scents are not just air fresheners, they use refined enzymes to eliminate odors completely, then help prevent new odors from popping up over time. Stale odors and old food smells fouling up the car? Mist some Morning Wood Scent to destroy odor-causing maladies at their source and keep the air smelling clean and fresh. Freshen the air inside any coupe, sedan, SUV, or any other enclosed space that needs a touch of class. Do the spaces in the car, home, or office need some freshening up? Release the stiff tension of bad odors and smelly air with Chemical Guys Morning Wood Scent. Chemical Guys is renowned for fun fragrances and powerful odor eliminators, and now we 're adding a touch of class to the lineup with Morning Wood Scent. Hardwood scents have long been used by the most affluent and well-to-do in society, who prefer scenting any room or body with this fragrance over synthetic fruity perfumes. These perfume makers seek out earthy musk scents that capture the power, virility, and subtlety of nature, then distill them into their expensive products for sophisticated palettes. We looked to their example, then came up with our own Morning Wood Scent Air Freshener & Odor Eliminator. The scents of sandalwood, cedar, and redwood bring nature into any enclosed space, while refined musk suggests the raw power, prowess, and grace of wild forest creatures. Top notes of spices and herbs soften the scent and round off the entire ensemble into a cohesive and sophisticated fragrance worthy of any fine automobile, home, office, or any other shared den or space. 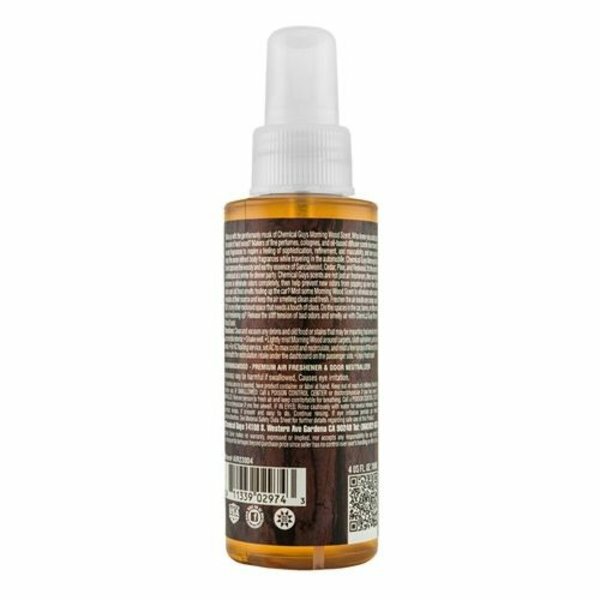 Mist some Chemical Guys Morning Wood scent into any room and embrace your wildness, sophistication, and power all at once. Morning Wood By Chemical Guys is more than just an odor eliminator, it 's the sensation of pitching a tent deep inside the heart of the Redwood forest as you gaze upon the petrified, and unyielding Sequoia trees. Every addictive droplet of Morning Wood unleashes the burly outdoorsman lying dormant deep within our coy exterior. The rich medley of earthly aromas of Sandalwood, Cedar, Pine, and Redwood marinate together to create the most robust Odor Eliminator Chemical Guys has ever produced. 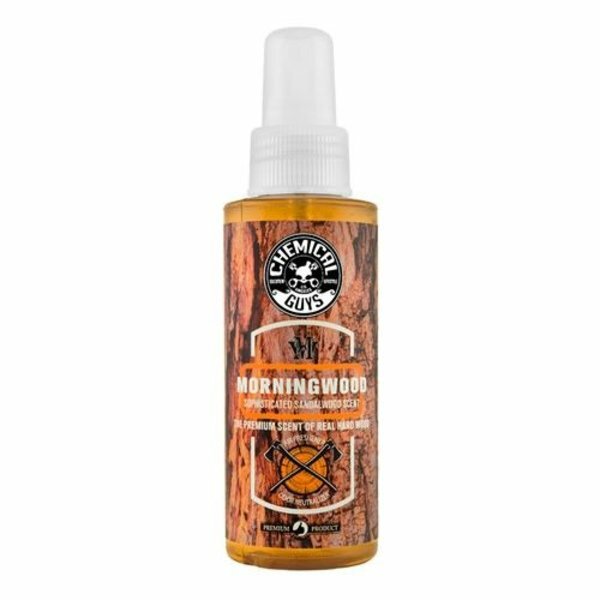 A fresh mist of Morning Wood by Chemical Guys will have you standing at attention, a thick beard will suddenly sprout from your bare chin, and other people will immediately notice the stiffness of your handshake. Offensive odors in your car make it difficult to concentrate, however with Morning Wood by Chemical Guys, every occasion finishes with a happy ending. Chemical Guys engineered Morning Wood Air Freshener with active odor eliminators and neutralizers to rapidly subdue undesirable smells right at the source. Morning Wood Air Freshener & Odor Eliminator pleases the senses with the sophisticated scents of hardwoods, musk, and spices. Morning Wood Air Freshener & Odor Eliminator is enriched with musky overtones, delivering a masculine scent that lasts weeks, not days. One spray is all you need for a full size vehicle. Embrace your inner gentleman and show your refined palate with Chemical Guys Morning Wood Air Freshener & Odor Eliminator. Morning Wood Sophisticated Sandalwood Scent Premium Air Freshener & Odor Eliminator is available in 16 ounce size.